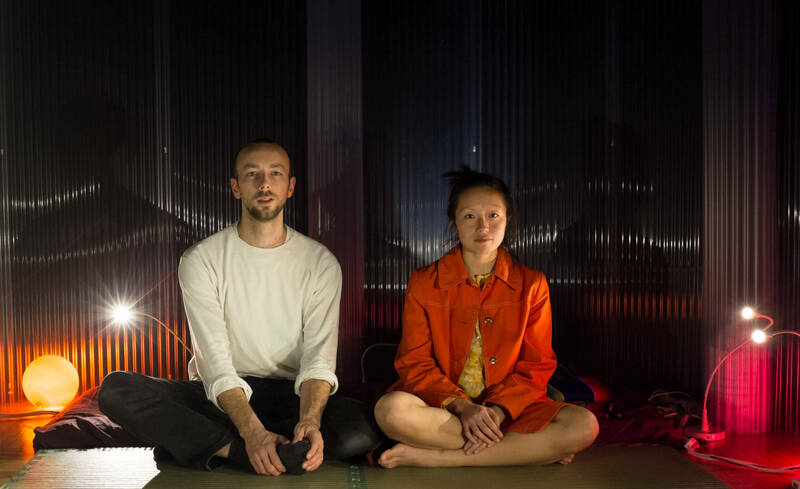 Jan Lee & Tim Murray-Browne are artists intertwining choreography, immersive performance and digital interactivity. In 2015, Jan Lee & Tim Murray-Browne created This Floating World (2015), an audiovisual performance of ethereal visual landscapes created by the movements of a dancer. Following this, their research project Waiting For a Grain of Sand to Leap Into the Air (2015) was selected for the DRIFT residency in Rio de Janeiro. Here, they explored the relationship between interactivity, sound, movement and narrative, leading to a series of sonic experiments encompassing tangible audio forms, sound stories, and immersive sound spaces. This culminated in Oorgavé Oorgavé (2015), an improvised performance of alien travellers forming new languages through sound poetry and body-activated sound spaces. In 2016, they completed a residency with ZU-UK at GAS Station, London, where they developed Movement Alphabet. Their work together has shown at venues including Tate Modern, The Victoria & Albert Museum and Centro Popular de Conspiração Gargarullo, Brazil. Jan Lee is a performance artist working at the intersection of dance, music and theatre. Her work explores issues of identity and cultural hybridity, often bridging artistic forms. It includes devising and choreography for ensembles, improvisation scores for site-specific work, spoken word and sound poetry, music improvisation for theatre and dance productions and installation-based work. In 2015, Lee researched digital interaction within immersive theatre on the DRIFT residency in Rio de Janeiro with acclaimed immersive theatre company ZU-UK. Here she created Dolphin Hotel, a story revealed by audience members activating sounds in different points in space and mapping this world in chalk on the floor, in collaboration with Tim Murray-Browne. Her other significant works include How to Play a Room for (3) dancers (2016), a performance exploring cultural alienation through introducing musical structures and improvisatory scores into the choreographic process; This Floating World (2015), a duet between dancer and digital landscape; and Pedestrian Patchwork (2012), a site-specific performance of improvised creatures blurring boundaries between performer and audience. As a performer, Lee has worked with a diversity of artists who work in sound design, dance theatre, neuroscience, digital interactive technology, poets, actors and musicians. Her performances include This Floating World (2015), After The Fall (Neil Paris, 2015), The Next Room (Roddy Skeaping, 2014), Looping Under a Tree (CoCoDanse, 2014). Tim Murray-Browne is an artist working with code, sound and visuals to create interactive installations and performances. His work often involves physical interaction to explore embodied experience – preverbal sensations of place, significance and understanding. His other works of significance include The Cave of Sounds (2013), a bespoke musical ensemble exhibited for the audience to play, for which he was awarded the Sonic Arts Prize in 2014 and Anamorphic Composition No. 1 (2015), a sound sculpture revealed as the listener moves through space. Murray-Browne graduated with a First class Masters in Maths and Computer Science from Oxford University in 2008. He completed his PhD researching interactive art and music at Queen Mary University of London in 2012. He was Sound and Music’s Composer in Residence at The Music Hackspace in 2012-13. He has since completed residencies with ZU-UK in Rio de Janeiro and London. He has additionally worked with leading creative studios including Random International and Field. 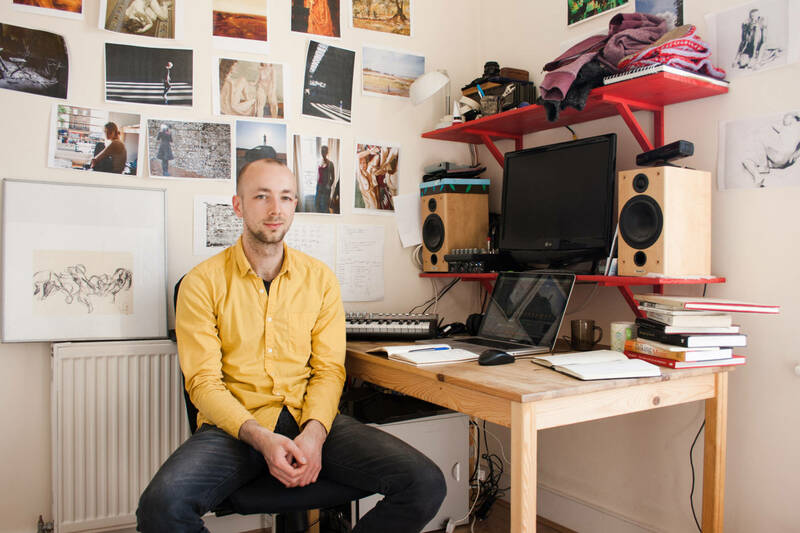 Since February 2017, Murray-Browne has been an Associate Artist of Music Hackspace at Somerset House Studios in London.